And the winner is…hang on – we’re not there yet. I love music but I’m not an audiophile. I judge sound quality not scientifically (high, low, mid-range, etc.) but in simpler terms. I mostly listen to music from the iPhone while commuting. Hence, noise isolation is important, my neighbor’s phone babbling isn’t. I believe my ears have standard size more or less. Among the four chosen candidates price isn’t an issue for me, I’ll buy the “best” i.e. most suitable of these. I have no brand preference whatsoever. I’ve been using Sennheiser in-ear phones (no headset) for the last two years and I’m very happy with them. I first unpacked the Klipsch buds. I put them on and was disappointed by the fit. In fact, they hurt. So, I exchanged the fittings with larger ones. They fit a little better. I later learned that it takes some getting used to (meaning they feel better after a few minutes). Then I tried the Etys. Same story, just worse. They come packaged with the small 3-flange eartips and I had to exchange them for the regular grey 3-flange eartips. The fit was a little better, but since these go down the ear canal instead of just sitting in your ear lap, it still is a little odd and it hurts. It feels like the eartips are too long for my ear canal. Already a bit worried – didn’t I say I thought I had standard-size ears? – I tried the Bose buds. Their “revolutionary design” promises super-comfy earphones. Really, putting them on is odd, they look terrible but they fit perfectly. You barely notice they sit in your ear. Pure comfort! Last but no least, I tried the V-Moda. Similar story than with the first two. 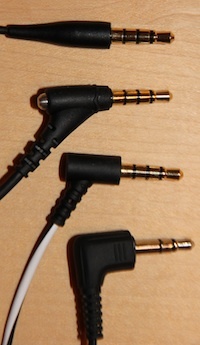 The “standard” eartips are the (too) small ones. That may look more stylish on the marketing photos but they hurt. The metal-edges are just too sharp. After I exchanged the eartips with the larger ones the fit was perfect – like with the Sennheisers. The eartips are large enough to keep the sharp edges away from the sensitive ear skin. 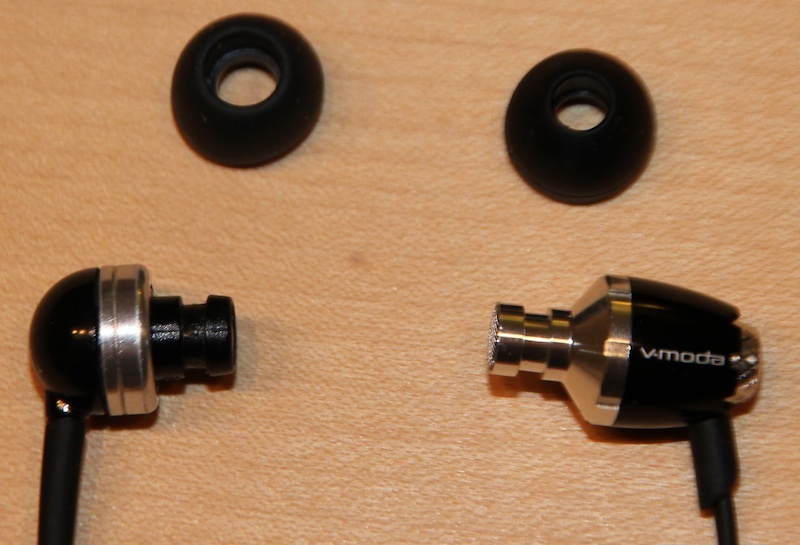 While exchanging the V-Moda eartips I noticed that the construction of the tips and the “tube” underneath it is almost exactly like with my current Sennheiser buds. V-Moda vs. Sennheiser, where’s the difference? The first sound check was devastating – for the Etys. The best purest sound comes from Bose. The sound is nicely balanced and crisp clear, a delight. The V-Modas are a bit on the “heavy” side, an extremely rich and full sound. I like the bass. It’s not overly prominent but it’s strong. The Klipsch are somewhere between, very clear and nicely balanced sound. And the Etys? Well, they sound thin and shallow, a real disappointment. → The Etys are out, sorry. So, I moved on to compare the various connectors. The Sennheisers traditionally had a 90° plug which I like a lot for various reasons. V-Moda and Bose (plus Etymotic for that matter) now use a 45° plug while Klipsch has a straight one. The straight plug is my least favorite. The Bose connector stays closest to the device, I guess it’s less than 45°. Next test was noise isolation. I don’t say noise-canceling because for me canceling is active while isolation is passive. I said in the beginning that noise isolation is rather important for me. However, I wish it wasn’t because this requirement actually killed the Bose candidate. Due to their design they offer virtually no isolation, what a pity. V-Moda’s isolation is really good and also the Klipsch are not bad. The Etys offer nearly 100% isolation but this comes at a price (see above). → For Bose the game is over, soooo sorry. Interestingly, both remaining candidates have the mic where the left and the right cord meet on chest level. Bose and Etymotic have the mic “box” dangling on the right cord around your mouth/chin. I compared both the mic quality and how easy the control buttons are to operate. To judge mic quality I made a number of recordings with the iPhone’s built-in Voice Memos app. If the room is quiet the V-Moda mic and the Klipsch mic perform equally. With background noise Klipsch filters more effectively. 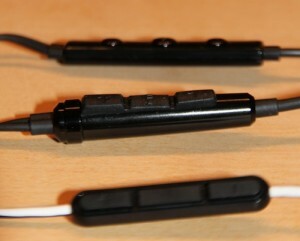 The Klipsch control buttons are easiest to operate both thanks to the nice tactile feedback and the button shape & size. V-Moda is close, though. 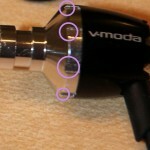 It’s generally easier to use headphones which have the control panel on chest-level. You can’t see which button you touch when the control panel is right of your mouth. Besides, the Etymotic’s control panel’s buttons are ridiculously tiny (3mm in diameter). For anyone not interested in noise isolation I’d recommend the Bose buds: perfect fit, best sound, clever plug, just about acceptable controls. No wonder they have near perfect rating at Apple and Amazon. Personally, I have a hard time deciding between V-Moda and Klipsch. V-Moda is more comfortable to wear, the sound is full with a tendency for too much bass, the plug is 45° and the controls are ok. Klipsch rates second in sound quality, best in control panel and mic but they’re a little less comfy to wear than V-Moda at first. 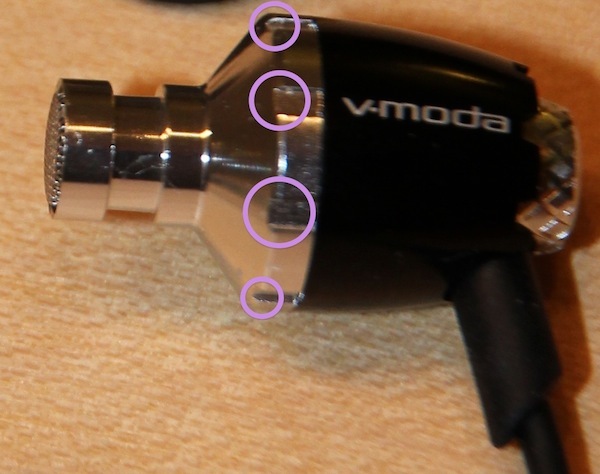 On the other side V-Moda suffers quite a bit more from cable noise than Klipsch. I eventually bought the Klipsch. Absolutely no regrets so far. Thank you very much for this review!!! Glad it was useful to you. Which headset did you eventually buy?